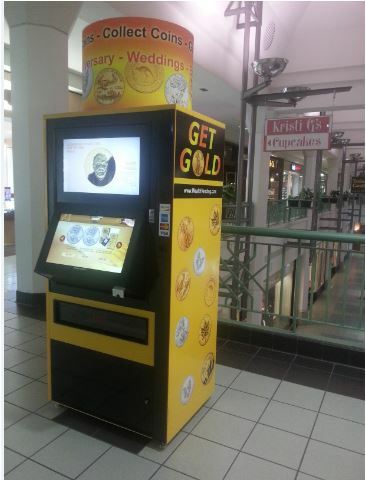 GetGold - A vending machine that sells Gold & Silver coins at the Vista Ridge Mall. A new type of vending machine is now in the Vista Ridge mall in Lewisville, TX. Shoppers can now buy gold and silver coins for gift giving or for adding to their collections from a vending machine. GetGold Vending Kiosk: Get Gold & Silver Coins for Gifting & Collecting. LEWISVILLE, Texas - Oct. 14, 2013 - PRLog -- Wealth Vending LLC has partnered with Adcomp Systems Inc. the manufacturer to create vending machines that sell gold and silver coins. As far as we know, a gold and silver vending machine of this type is the first of its kind in the State of Texas. These machines are popular in overseas markets. A gift of gold or silver leaves a lasting memory and usually stays with the recipient forever. Shoppers can now buy pre-packaged gifts for all occasions – birthdays, anniversaries, graduations, new born babies, valentines day, mother’s day, father’s day, thanksgiving, Christmas and many occasions. Wealth Vending LLC is a new start up that sells gold and silver coins from the machine in various price ranges with gift boxes as well as online. Wealth Vending believes that gold and silver hold their value over time and should be added to everyone’s savings plan. Gold and silver make wonderful gifts for any occasion. Gold and silver coins are a great way to teach children or the young at heart about the monetary system, coin collecting, savings and investing. Best of all, gold and silver never expires, become obsolete, or goes out of style. Wealth Vending LLC can show interested customers how to purchase precious metals at wholesale prices to add to their portfolios.